Converge recently received two AVA Digital Gold Awards for their work with Santa Clara University and Mount Vernon Nazarene University. The AVA Digital Awards are an international competition recognizing excellence by creative professionals responsible for digital communication. Since its fruition in 2011, Converge Consulting has worked with over 150 colleges and universities, bringing programs to market for many of higher education’s leading brands. The digital agency has deep experience supporting enrollment growth in the business and graduate school marketplace. Converge’s client roster is home to Clemson University’s No. 1 ranked Master of Education, No. 7 Best Education School Teachers College Columbia University, University of Iowa’s top 20 ranked College of Public Health and multiple top 50 business schools, engineering schools and graduate programs. The agency recently received two AVA Digital Gold Awards for their work with Santa Clara University and Mount Vernon Nazarene University. The AVA Digital Awards are an international competition recognizing excellence by creative professionals responsible for digital communication. Santa Clara University Leavey School of Business, located in Silicon Valley, launched a digital advertising strategy to market their MBA, EMBA and four master's degrees, as well as three certificate programs. Leavey also works with Converge to build a brand awareness campaign for their school. Over the course of the partnership, the school has tripled MBA enrollment and doubled enrollment for their masters in supply chain management and finance. 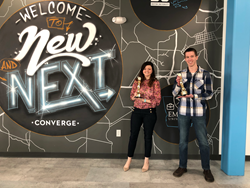 "Converge has helped us to not only grow our enrollment, but to think about innovation in higher education in a new way,” said Theresa Strickland, Chief Marketing Officer at the Leavey School of Business. Mount Vernon Nazarene University, located in Mount Vernon, OH, worked with Converge to develop target audience personas that fueled a multi-channel digital advertising plan. The campaigns drove qualified students to the MVNU website and accelerated their 2017-18 applications and enrollments. The Association of Marketing and Communications Professionals judges each AVA Digital Awards entry at random and based on merit. Judges verbalize criticisms and compliments and agree on a score. Entries are given an award based on the score they receive.